Born in London in 1906, Elizabeth Lutyens was a trailblazer in British music, both as a woman composer and serialist. Although her hands were full with the obligations of raising her four children and supporting her mostly unemployed husband, her output is impressively prolific. She was able to handle large orchestral forces with consummate ease, and her chamber pieces are no less impressive. The two works on this disc are prime examples of her acumen in both fields and should go a long way towards establishing her art on firmer ground. 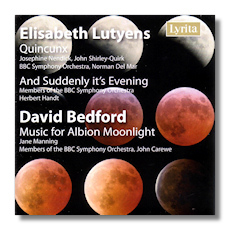 "Quincunx" dates from the years 1959-60, and in it Lutyens manages to involve the listener with her potent emotional expressiveness and brilliantly varied textures. "And Suddenly it's Evening" was composed in 1966 and is one of the composer's most renowned works. The piece is held together by constant "ritornelli" returning of the various instrumental groups and with its relatively simple yet sensual textures and cogent form. She manages to create a poetic immediacy that is indeed magical. David Bedford is famous for his association with the Kevin Ayers cult band "The Whole World" in the late 1960's and for his collaborations with such musicians as Mike Oldfield (Orchestral Tubular Bells, The Killing Fields) and also composed music for other films such as "Orlando". "Music for Albion Moonlight" is full of anger, suffering, longing and resignation and the music is very involving to say the least. Performances are vivid, exciting and thoroughly commanding, and although this is mostly difficult terrain, the rewards are great. This is definitely 20th-century British music at its very best.